If you have been following us for a while already you have probably noticed that we are not big fans of ICOs and we aren’t covering much of these, even though lately there is a boom of Initial Coin Offerings and it seems that pretty much everyone is releasing tokens for something. There are however some that we do mention and take part into, mostly in serious ICOs that are being pushed by entities that already have some good product or service available and have some background and not just promises that might as well turn out to be empty. Once in a while there are some that are really worth talking about and that goes not because they have generated a lot of noise or have managed to secure insane amount of funding, but because they are really something worthwhile, different, disruptive and so on. A recent such example is Brave’s Basic Attention Token (BAT) that we have covered as we’ve been following the development of the Brave browser for a while already. Another interesting ICO that we think is worth talking about and taking a part in is the Giga Watt (WTT) Token that is currently ongoing and will continue until July 31st or until all of the 30 Million tokens are sold. The Giga Watt WTT token are being issued on the Ethereum blockchain like many others that we have seen recently, but what is different here than most other ICOs is the fact that the launch of the ICO is together with a whole platform to support the token (as well as other future tokens). One of the issues with Ethereum ERC20 tokens we are seeing is that normally they are not very easy for people that are not more into Ethereum to take part into… the process is just really not that easy for not so technical or “into crypto” type of people. The WTT tokens are being distributed via the new Cryptonomos platform for token sales as well as management. The Giga Watt (WTT) Token is essentially the first token launched together with the platform for easy purchase and management of the available tokens by the user. This eliminates the need for the user to look for compatible Ethereum wallets and to do complex things in order to take part into an ICO based in a crowdsale essentially significantly lowering the requirements and removing many of the obstacles. Thanks to the Cryptonomos platform you can easily transfer Bitcoin (BTC), Ethereum (ETH) or cash via a wire transfer and use them to purchase WTT tokens, and probably other tokens in the future as well. You should be also able to transfer tokens in and out of the platform when they are abvailable just like you would do if using a compatible Ethereum wallet for interacting with smart contracts. Of course there is the other point of view regarding the use of a dedicated platform – you are not in full control of your tokens like you can with an Ethereum wallet for example where you hold the private keys for the wallet. Let us get back to Giga Watt (the former MegaBigPower), a USA-based company offering crypto mining hardware as well as hosting for it and of course enough electricity to power it and keep it cool. 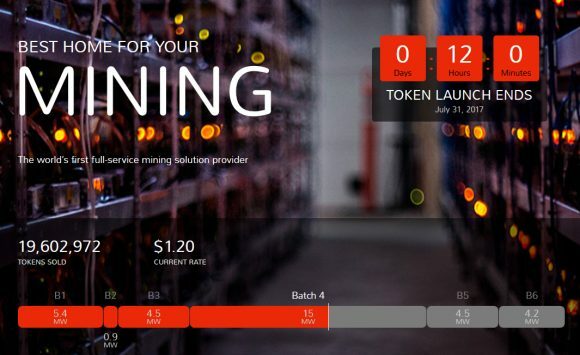 The company offers also users to host their own existing miners and even an add-on paid option of emergency equipment repairs in case of an issue in order to minimize downtime. 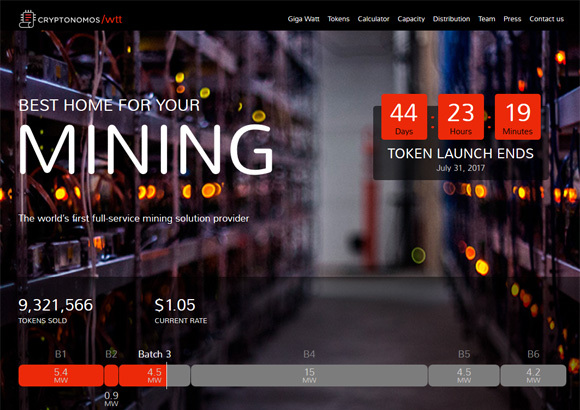 The release of the WTT token allows the token holders to gain access to Giga Watt’s facility at a lower hosting rate, which in turn significantly increases the mining rewards. Each Giga Watt Project Token (WTT) represents the right to use the Giga Watt processing center’s capacity, rent-free for 50 years, to accommodate 1 Watt’s worth of mining equipment power consumption. Token owners can use the capacity they purchase to accommodate their own miners or if they don’t own or plan to purchase any miners to take advantage of the hosting offer to just rent it out to other users. The idea that Giga Watt has is to use the token sale to be able to expand their capacity and to reward token holders that help them achieve that, so a win-win for both sides. For all the details about the Giga Watt (WTT) token and the plans of the company issuing it you should take a look at the detailed WTT token whitepaper (PDF) where everything is explained in much more details and all your questions should be answered.